The instrumental music program at Cherry Avenue Middle School has a long history of success and musical excellence. It is our goal to shape positive attitudes, instill work ethic, and create a sense of family and community at school. Many musicians from our instrumental music program graduate with honors and continue in high school and university programs across the state. 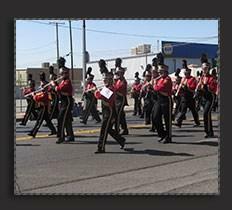 Students participating in instrumental music at Cherry Avenue have the opportunity to grow musically, compete in local and state level competitions, be an ambassador for the school, make friends, and travel within our community and Central Valley. Visit our website for dates and other important information.